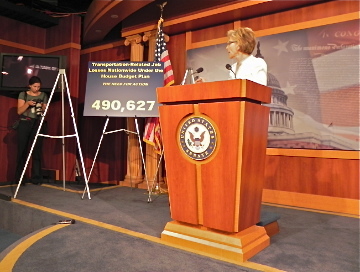 Sen. Barbara Boxer (D-CA), chair of the Environment and Public Works Committee, says a transportation reauthorization bill needs to be passed soon in order to avoid the loss of 600,000 jobs in the construction and transit industries. She issued a call to action this morning, pushing for a new bill before the current extension of SAFETEA-LU expires on September 30. Though she had initially pushed for a six-year bill, Boxer made it official that the EPW proposal is for a two-year bill that will only cover current funding levels plus inflation—about $109 billion over the two years. She said the Finance Committee is “very optimistic” that it can find the needed $6 billion per year in addition to the Highway Trust Fund revenues. There are “various ways to get there,” she said, but her preferred method is to redirect funds from the expensive wars abroad. At today’s press conference, Boxer focused mostly on the urgency of saving 500,000 construction sector jobs and 100,000 transit jobs, citing new Federal Highway Administration stats about the ramifications if Congress passes Rep. Paul Ryan’s budget, with its 30 percent cuts to transportation. Boxer’s aides pulled out charts detailing just how many jobs would be lost in each state, and Boxer pointed to the over 43,000 that her home state of California would shed. As we reported recently, some criticize Boxer’s jobs-centric approach, since jobs are just a small part of the bill’s long-term boost to the economy, but jobs and unemployment are still the hot-button issues of the day, and clearly Boxer thinks it’s a winning issue. As for the parts of the bill that the “Big Four” on the EPW Committee still need to iron out, Boxer wouldn’t give details, but said, “I think we’re getting extremely close. I don’t see any major disagreements at all.” She declined to comment on either an Infrastructure Bank or guaranteed federal funding for bike/ped projects, but confirmed that there will be no earmarks allowed. “This is a very strong priority for the nation—you can’t be a great economic power without investing in infrastructure,” she said.